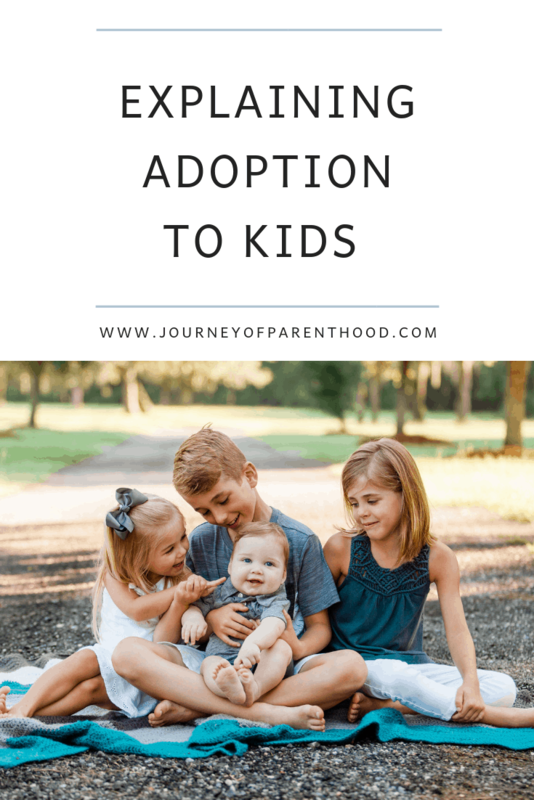 Today I’m linking up with Mix and Match Mama and A Little Bit of Everything to share How We Talk Adoption to Kids I love the timing of this post with it being National Adoption Month! After having three biological babies we felt lead in a BIG way to adoption. God put it on our hearts and we listened and proceeded to go through the process of domestic private adoption in order to have our son enter our family in December 2017. I blogged about our ENTIRE journey and you can read all of those posts on our Adoption Page here! It was important to my husband and I to include our children in the entire adoption process. When we initially made the decision to add to our family through adoption our children were ages two, four and seven. 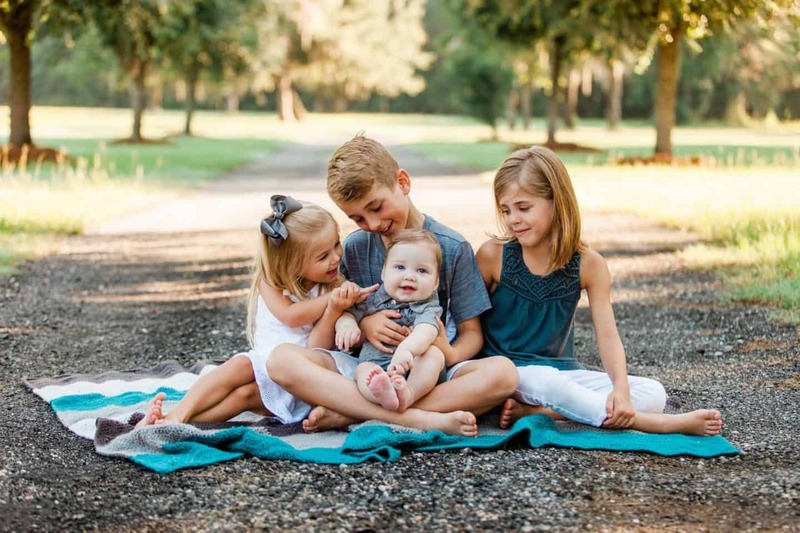 While they may not have been old enough to fully understand or to have very in-depth questions we still wanted to make sure they were part of each step throughout our adoption journey. 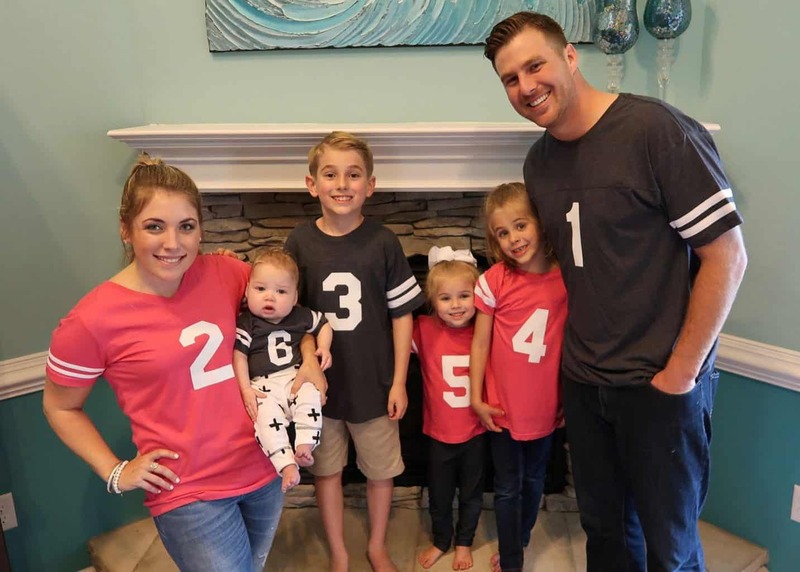 Just like our children are a big part of our pregnancy experience, the time in waiting for adoption is an important time for the entire family too and in sharing the process together it helps to prepare everyone for the new baby to come! The question may be asked: What’s the best way to explain adoption to your child? For us when it came to telling children about adoption we did not want to overwhelm them or confuse them. I’m a big believer in being honest with children but also keeping things simple and at their level. We answered questions as they were asked but overall just kept the explanations very simple. God put it on our hearts to adopt. Mommy wouldn’t have a baby in her belly. 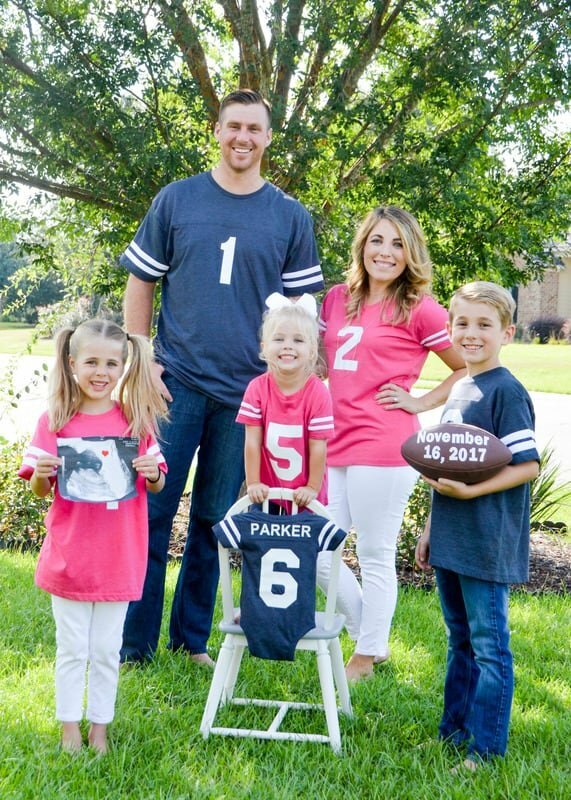 We were waiting for God to connect us with another Mommy who would have a baby in her belly. This Mommy would then decide if we were the right fit to raise her baby in our family. We prayed every night as a family throughout our entire waiting process (which was 16 months until we were matched). We never shared details with our children. Much like when I’m pregnant we don’t share details either. They don’t need updates on every change or worry or concern. I’m passionate about letting our children be children and think it’s important for the parents to carry those burdens while at the same time allowing our children to see and understand when paths aren’t always easy. Days came that were hard. We had many “no’s” when presenting to potential birth mothers. Sometimes those “nos” hit me hard. I didn’t hide those tough feelings from our children. I shared with them those tough moments while at the same time reminding them that we trusted God and the process and would just keep praying and waiting. It’s okay to have those hard days. They happen. And it’s healthy to share that as a family just as we share the happy days together too! Once we were matched we showed the kids photos of the expecting mother and told them very basic information about her. Nothing about her life situation or other such details. Just that she had other babies and that she chose our family to raise the baby in her belly. While we did our best to keep things positive and upbeat throughout our adoption journey, we did want the children to be aware that some risks were involved. Just because we were matched didn’t mean that we’d for sure be having that baby join our family. It was important for them to know that things could change and “Mama E” could decide to parent. Again, we focused on trusting the Lord and His plans for our family, for the baby, and for “Mama E” and what was best for her and her family too. During our match, we were able to all get together to meet with “Mama E” and her other children. Again, our children didn’t ask a lot of questions. They didn’t need a lot of explaining. We just let things flow naturally with those bonds. I loved her precious outlook and love knowing that adoption has opened the hearts of our entire family. Not just my husband and myself but all of our children as well. I want to raise children who love others. Who welcome people with open arms. People often say that adoption blesses the adoptive child but that is not the only blessing in adoption. It blesses EVERYONE in so many ways. It’s not just a blessing of a child joining a family. It’s blessings affect so many areas of all of our lives and will continue to do so well into the future. I love that all of our children have learned so many valuable lessons through this process and have learned to open their hearts so wide! When “Mama E” went into labor my husband and I headed to the hospital to be with her as she gave birth. Our children didn’t know any of those type of details. They weren’t aware that we’d spend 40 hours in waiting for “Mama E” to sign over her parental rights. They just knew it was baby time and that they’d get to stay with their grandparents for a few days while Mommy and Daddy were away. It was important to us to wait for our children to meet their baby brother until after parental rights were signed over to us. In the state of Florida once the rights are signed by the birth mother (or birth parents in some situations) there is no further waiting period. No time to change her mind etc. So once the rights were signed we knew he was a member of our family from that point on! We wanted to treat adoption as much like pregnancy as we could. 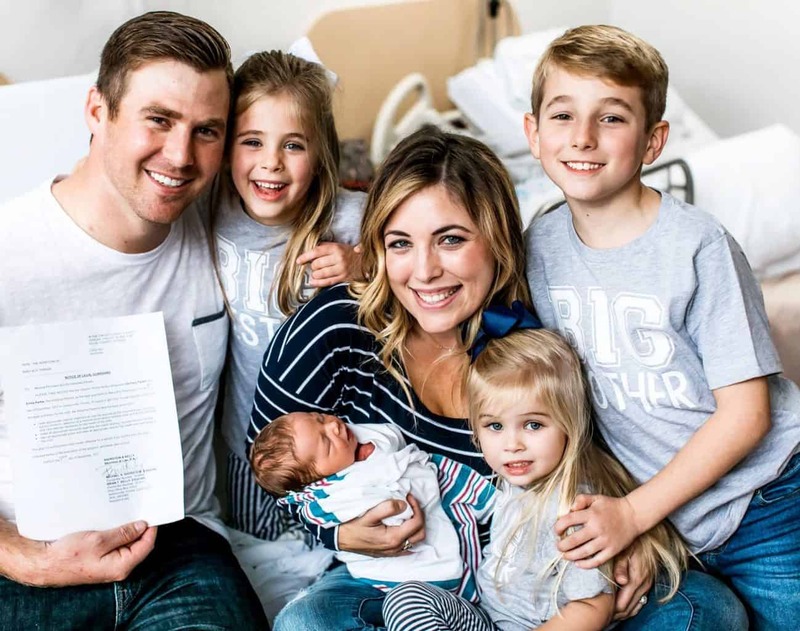 We wanted our newest baby, Spear, to have all the same experiences we gave to our biological children. We hired a photographer to be there to capture the moment when his older siblings came to meet him. We waited to announce his name until they were in that room holding him. It was SUCH a special day! After those rights were signed over to us, we had to wait in the state of Florida until we were cleared to cross the state lines and head home. This was a two week long period. The children knew about this and understood we were waiting for paperwork. Once we were home life was just like normal with a newborn. He wasn’t their “adopted baby brother” he was just their “baby brother.” That’s it. Yes. It’s that simple. We didn’t spend our time talking about adoption. We spent our time bonding as a family! It was important to us for ALL of our children to be present when the adoption was finalized in May 2018. 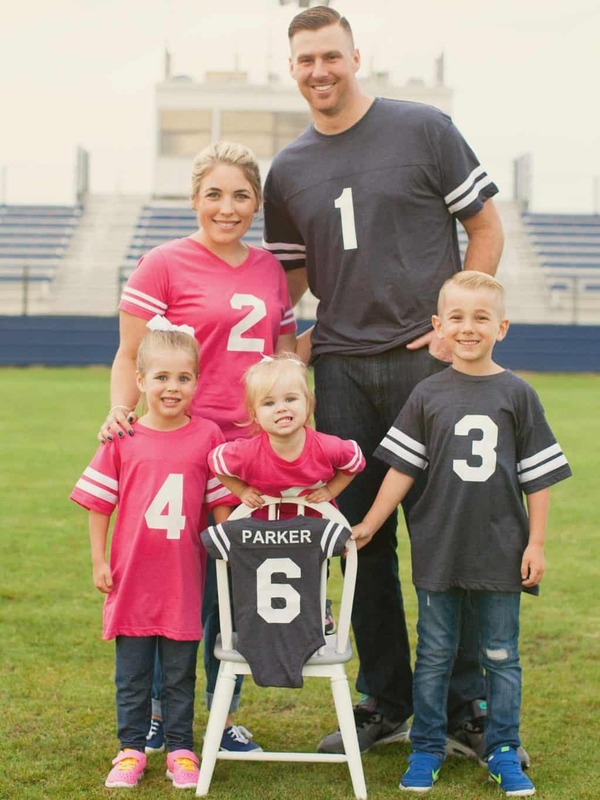 All of our children walked through the entire adoption journey beside us and I wanted them all to be there when Spear was officially made a PARKER! In explaining the finalization to our kids we simply told them that Spear was already our son but that he was getting to truly have our last name on that day and that he’d be officially our baby forever and ever and ever. Again, simple and to the point. And none of the kids had any questions whatsoever! We have met up with “Mama E” and her children after finalization. We have an open adoption. We explained we’d be seeing them and reminded them that she had Spear in her belly. It was cute when we got there our now 7 year old went up to her and said “do you have another baby in your belly?” It was also SO awesome to see all the kids interacting with each other. It really hit our oldest child (now nine) during that time together and he spoke up while we were all eating and said “Wait. So if we’re Spear’s brothers and sisters and they are his sisters too then that means we are ALL brothers and sisters!” It made my heart SO happy to hear him talking about family like that and to welcome and love on Spear’s biological family just as he does his own family. It has been such a gift to know Spear’s biological family on such a personal level and sitting back and seeing all of our children play so well together and make those individual connections is truly something special to witness! While we don’t know what the future holds regarding the relationship between our family and Spear’s biological family (our legal agreement is only photos, there is no set plan on meetings), we will always continue to raise all of our children to have so much love, respect, and appreciation for the incredible gift they gave us when they chose our family to raise Spear! At what age do you tell your children that they are adopted? Our answer is never. Spear will always know he joined our family through the gift of adoption. That will never be something we keep from him or wait until a certain age to tell him. However, we will always just be his family. Not his adoptive parents. Just his parents. Not his adoptive siblings. Just his siblings. If a relationship continues with his biological family, then he will always know both of his families. Having a biological family doesn’t make our family any less his family. I’m not less of his mother because he also has a different biological mother. His siblings are still his siblings. Biological or adopted. He is loved equally by us ALL and having those bonds only reinforce that love! We know there will come a time that Spear will have questions. It’s extremely important to me to always talk highly about his biological family. His birth mother was simply not in a place in her life where she felt raising Spear was the best thing for him. So she did THE most selfless thing any mother could do and she chose us to raise him and have him join our family. That is what we will say when the time comes. That is what we will say when any of our children may ask. This is what will be said when explaining adoption to classmates. To friends. To future people who may enter Spear’s life. I am thankful I have so much information about Spear’s biological family through getting to know them all on a personal level. I’m hopeful that I’ll be well equip to answer personal questions he may have and that we will continue to be in touch with his biological mother and other relatives so that he or I may even be able to ask those questions about his story directly to them. I am not assuming the road will always be easy. I know there may come times when Spear has hard feelings about his story. I know there may be times where he may struggle with feeling like “the adopted child.” It is a delicate topic and something I never want to brush aside or take lightly. I always want him to feel comfortable talking to us about those feelings. Asking those questions. Having those tough conversations. Yes. I believe in keeping things simple when explaining adult matters to children but as these children grow up I know those questions will become deeper and will require more in-depth, adult answers. I know this isn’t really what this post is about but it is something I personally struggle with. Spear looks JUST LIKE our biological children. No one can tell he joined our family via adoption by just looking at him. They’d have to be told that in order to know it. On the one hand I don’t want to tell others about adoption. Why should he be singled out as “our adopted son”? We always want him to just be OUR SON. No different than our children who joined our family via pregnancy. Just another kid in our crew! However, our journey to adoption was inspired so much by chance meetings and conversations I had with others who had walked that path. By sharing Spear’s story with others we don’t know how that may impact them. Could it be the story that puts adoption on their hearts? Could it be their sign from the Lord that it’s the right path for them? Could it be that final seed that leads them to choosing adoption? Are we robbing Spear of his blessing to others by not sharing that? His adoption story is incredible. While we don’t want to single him out…he IS set apart in such a beautiful, wonderful amazing way. His story is one filled with walking in faith and a reminder of God’s ultimate plan and promise to us. By not sharing his story are we doing him a disservice? I haven’t yet figured out how to best navigate these waters. So far I’ve just kind of felt the room and situation and decided in the moment how to proceed. If I mention it I usually do it in a round-about-way that mentions adoption without going into detail or specifics and then just let the other person respond and go from there. 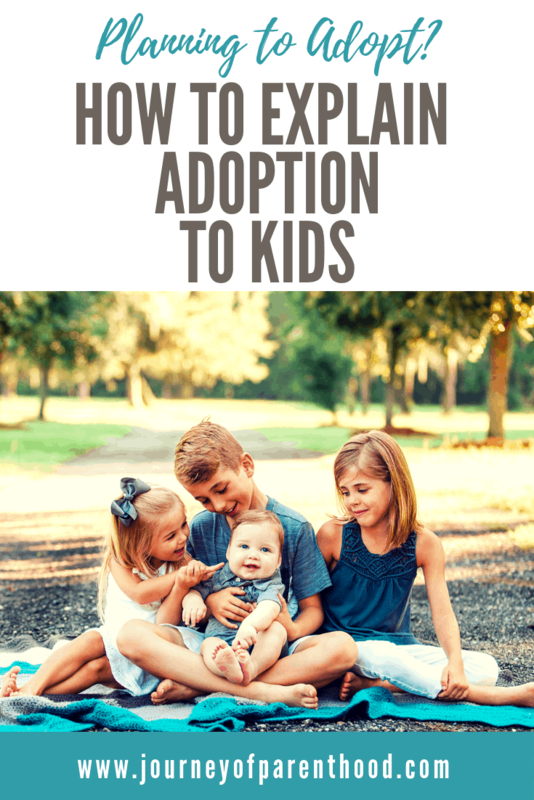 Often there is instant interest and questions and I love that opportunity to help educate and hopefully inspire someone else to consider adoption too! Sometimes we over think things and overly worry on topics like how to talk to kids about adoption. Explaining adoption to kids doesn’t need to be complicated. It doesn’t have to be too deep or too intense. Even for the child who joined the family via adoption it can all still be very simple. I am proud to be an adoptive parent but more than anything I’m just proud to be a mama to ALL my babies 🙂 Adoption is equally beautiful as it is heartbreaking and always putting the focus on the love both families have for the child is what is most important!